Family and Descendants of Edward Martin Patz, Sr.
Edward Martin Patz, probably taken in 1920. Edward Martin Patz was born on August 17, 1919, in Buffalo, New York. 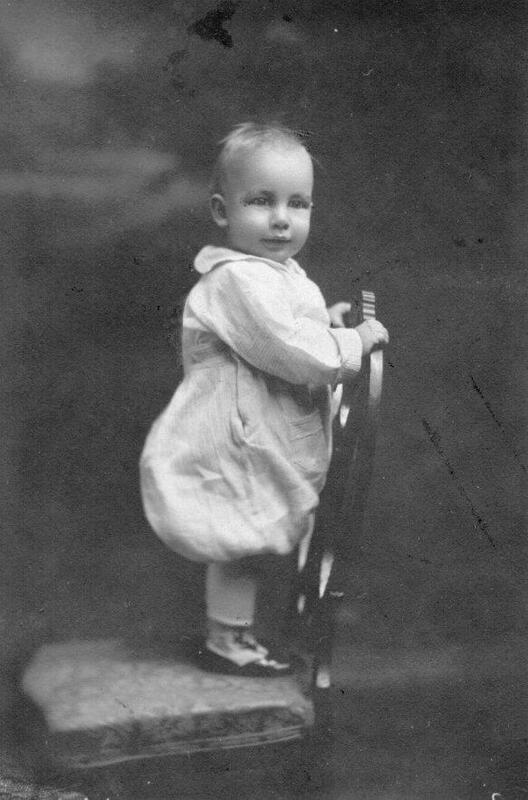 He was baptized on June 12, 1921, in Boston, Massachusetts. Edward's military records indicate that he attended public school in Boston, Masschusetts, completing coursework through the 9th Grade. On April 27, 1941, Edward married Geraldine Edith Marks. Geraldine was born in 1921 in Boston, Masschusetts. 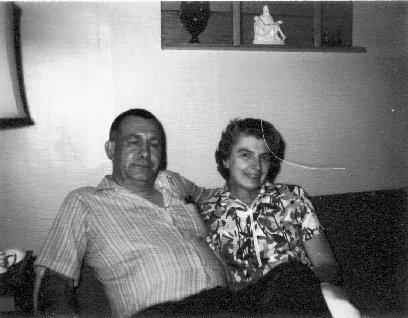 She was the daughter of Clifton S. Marks (native of Blue Hill, Maine) and Frances (née Oliver) Marks (native of Phippsburg, Maine). Up until 1942, when his daughter Frances was born, Edward worked as a bricklayer's laborer. He then became a bricklayer, in order to earn more money for his new family. Edward was inducted into the U.S. Army in 1944. During World War II, he served as a rifleman in Company C 385th Regiment, where he fought in Europe (battles and campaigns included Rhineland, Ardennes, and Central Europe). Edward was honorably discharged from military service on January 16, 1946. 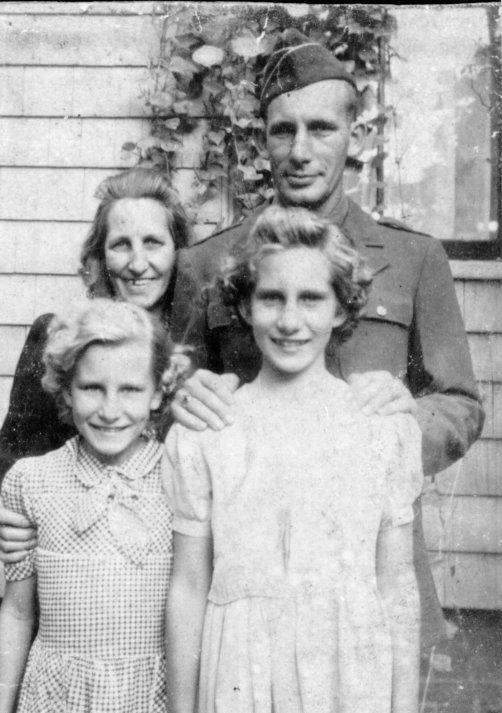 Frances (née Patz) Craig writes of her parents: After the war, Mom and Dad bought my grandmother's house at 143 Falcon Street in East Boston, where he lived for the rest of his life. He was very seriously burned in an accident in his back yard, lighting a charcoal grill, in 1970, and spent three months in the isolation burn unit at Massachusetts General Hospital, receiving several skin grafts, and several more months recuperating at home. He often joked about donating his body for an exhibit at the Smithsonian, because of the scarring on his trunk, arms and legs. He was not able to tolerate the chemicals used in bricklaying after that, so became a maintenance worker at Revere Memorial Hospital in 1971. He retired on disability in, I think, 1979, after his first heart bypass. He and Mom loved to camp and had a trailer in a campground in Rochester, NH. 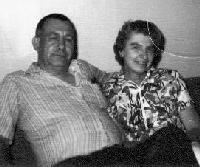 They also loved to travel, and took to spending their winters in Florida after they retired. He was always the life of every party, and had a large store of awful jokes. His greatest joy was his family, and he loved nothing more than holding his grandchildren and great-grandson in his lap and making them laugh. He had at least two heart attacks in 1986-7 and a second bypass in 1987, and suffered from congestive heart failure until his death in 1997. Edward died on September 20, 1997. He is interred in a plot adjacent to his parents at Woodlawn Cemetery, Everett, Massachusetts. The following is with reference to the award to Edward Martin Patz of the Combat Infantry Badge. This badge is usually awarded to a service man who faced personal combat/jeopardy in action during a war. The account is written by his daughter Frances (née Patz) Craig: "Dad was wounded by shrapnel (WW II), what he called a "Million Dollar Wound" in the shoulder. It didn't hit anything vital, but did cause stiffness enough to qualify him for a disabled vet abatement on his real estate taxes. (He knew about but never took advantage of that abatement until he was not able to work as a brickie any longer after his burn accident in 1970.) The Combat Infantry Award could have been for his service at the Battle of the Bulge? I know he fought there. I remember the scar quite well, a nasty looking puckered dent in the front of his shoulder and a surgical scar in the back where they removed the piece of shrapnel." This Military Service Record for Edward records both this badge, and his award of the Purple Heart medal. 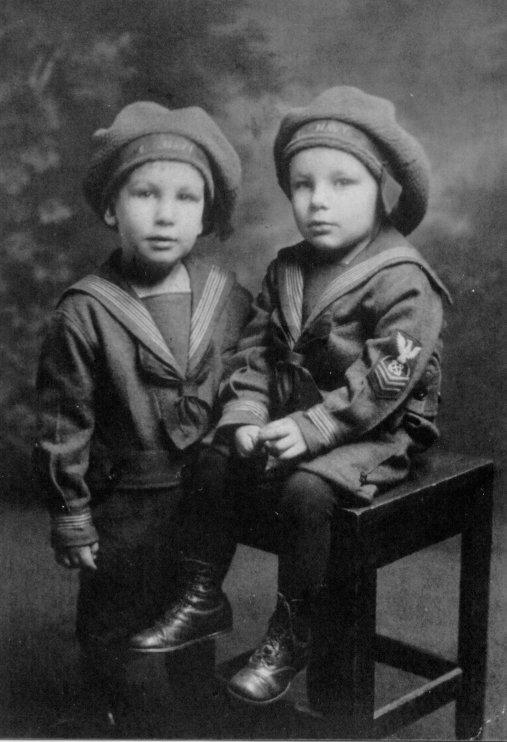 Edward Martin Patz and George Junior Patz (seated). (No date). 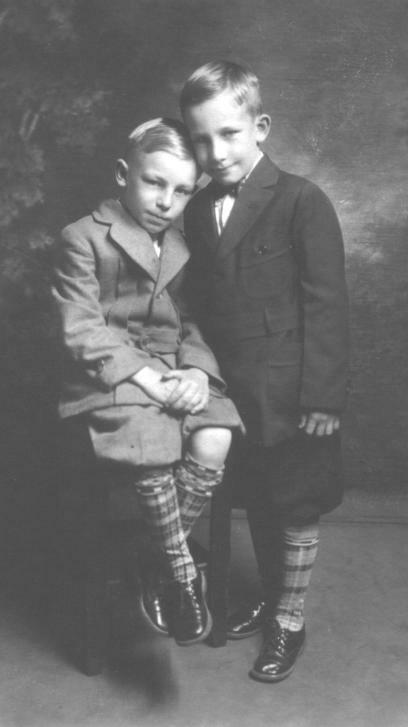 George Junior Patz (seated) and Edward Martin Patz. (No date). 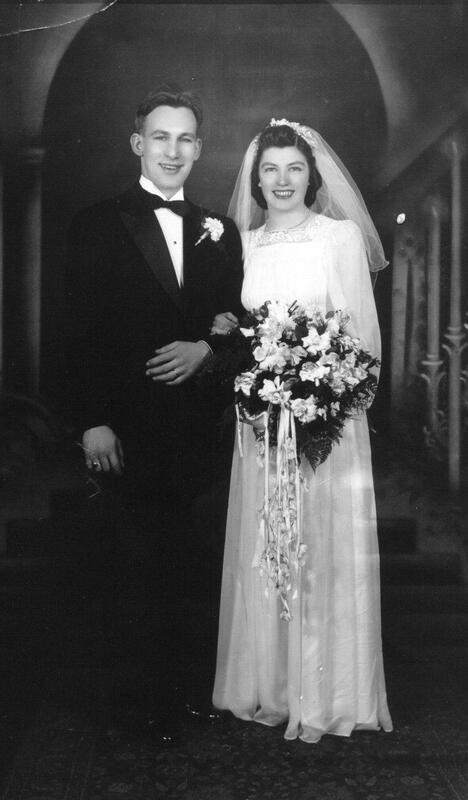 Wedding photo of Edward Martin Patz and Geraldine (née Marks) Patz, April 27, 1941. Clara (née Sawyer) Patz, with her children Edward, Phyllis, and Ruth Patz. (no date). 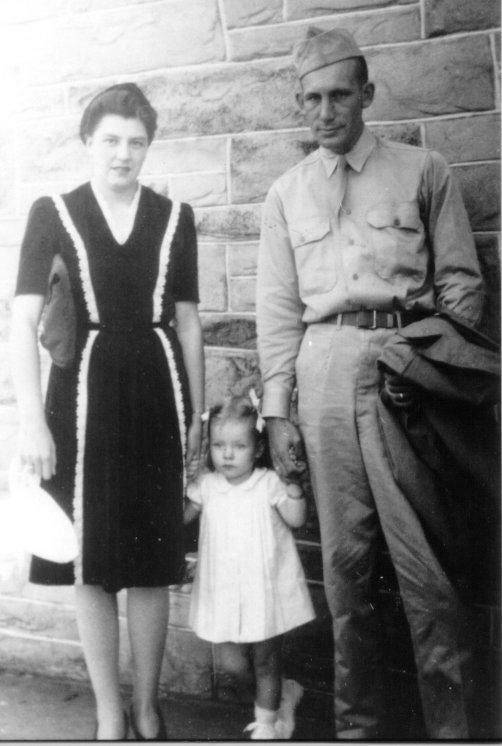 Geraldine (née Marks), Frances, and Edward Martin Patz. No date. John Joseph Patz: Born 1892; died 1950. Clara Louise (née Sawyer) Patz: Born 1897; died 1948. Frances Jane (née Patz) Craig: Living. Edward Martin Patz, Jr.: Living. 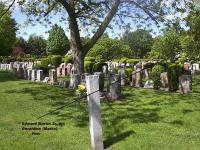 General location of the gravesite for Edward Martin Patz, Sr., Woodlawn Cemetery, Everett, Massachusetts. 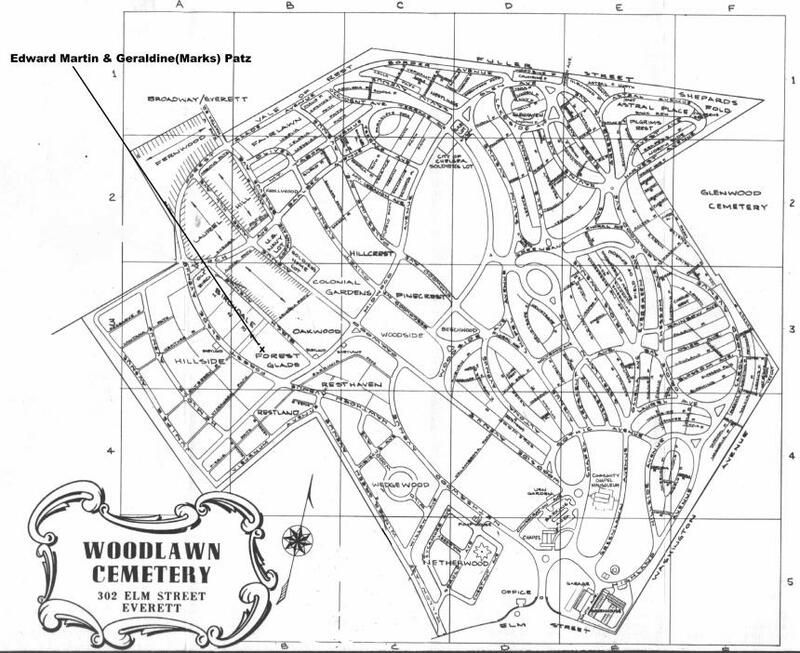 A map to the gravesite is available here. 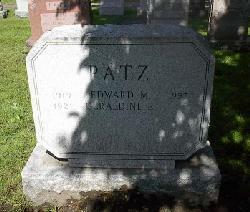 Grave of Edward Martin Patz, Sr., Woodlawn Cemetery, Everett, Massachusetts. Note grave of Edward's parents to the distant left. 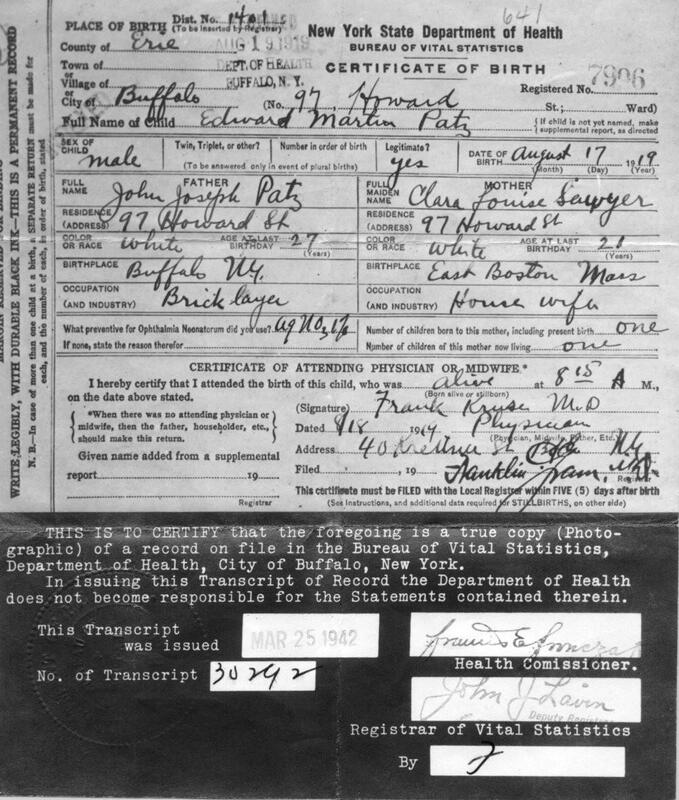 Birth Certificate: Edward Martin Patz, Sr., born August 17, 1919, in Buffalo, NY. 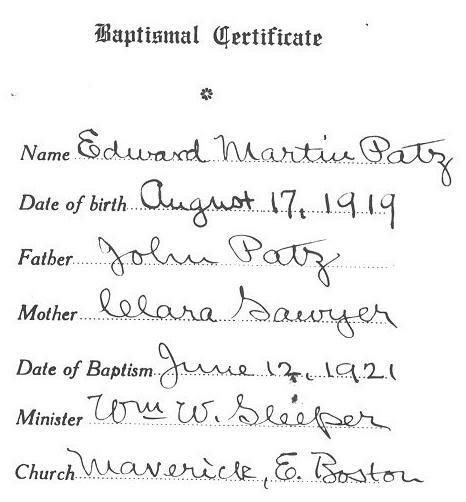 Baptismal Certificate: Edward Martin Patz, Sr., baptized June 12, 1921, Boston, Massachusetts. 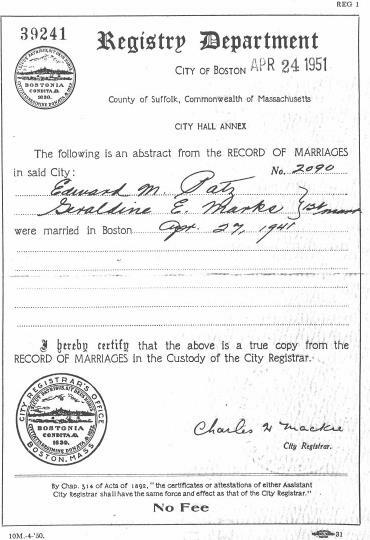 Marriage Record: Edward Martin Patz and Geraldine E. Patz, married April 27, 1941, in Boston, Massachusetts. 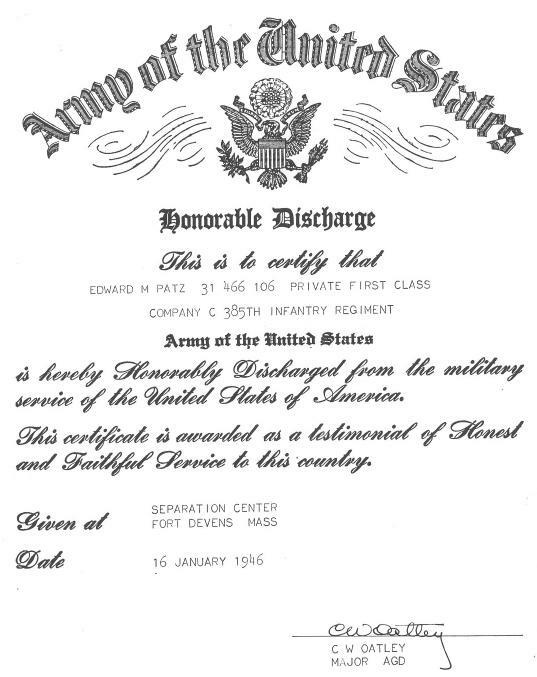 Military Discharge: Certificate for Edward Martin Patz, Sr., discharged January 16, 1946, from the United States Army, where he served in Company C 385th Infantry Regiment. Military Service Record: Edward Martin Patz, Sr., discharged January 16, 1946, from the United States Army, where he served in Company C 385th Infantry Regiment. 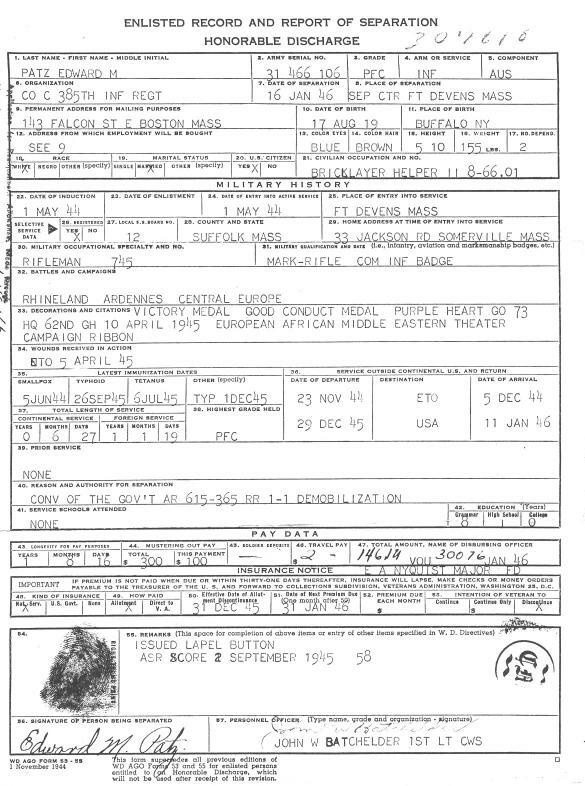 Military Separation Record: Edward Martin Patz, Sr., discharged January 16, 1946, from the United States Army, where he served in Company C 385th Infantry Regiment. 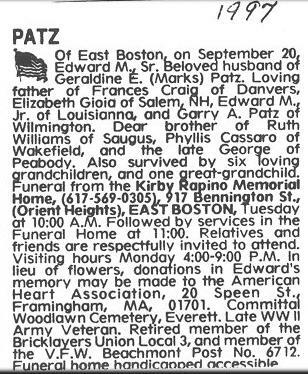 Obituary: Edward Martin Patz, Sr., died September 20, 1997. 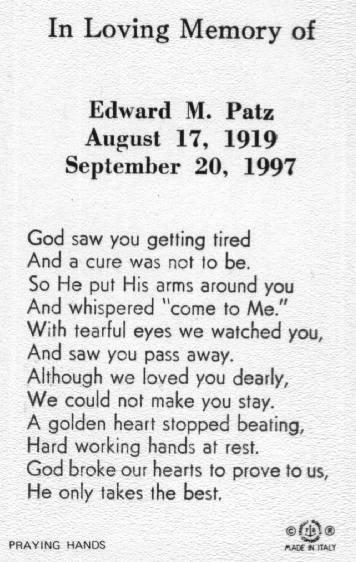 Funeral Mass Card: Edward Martin Patz, Sr.; born August 17, 1919; died September 20, 1997.